We’re changing the way America delivers healthcare in central Virginia. Check out these highlights of our brand-new patient care model and discover the remarkable opportunity that awaits you. Transparent pricing is simple. You pay the price listed on our website for your procedure. No endless paperwork, complex bureaucracy, or opaque pricing tiers to wade through. If you’re self-insured, uninsured, or you have a high deductible policy, transparent pricing will likely reduce your out-of-pocket costs significantly. On average, our flat fees are two-thirds the price of traditional hospital procedures. Who is eligible for transparent pricing? Everyone! However, if you have traditional insurance, usually it makes sense to utilize the normal pathway and we will bill them directly. Our transparent fee makes more sense for uninsured patients, high deductible policyholders, self-insured corporations, and self-insured individuals. Questions? Our billing specialists are on hand during business hours to help figure out the best course for you. Each quoted price includes the surgeon’s fee, anesthesia fee, and facility fee for any given procedure. This single fee will be paid to Monticello Community Surgery Center less the $250 deposit paid at the time of your visit to the surgeon (see below, “What if the surgeon determines I don’t need surgery?”). To keep our prices low, cash and check are preferred. Credit Card is acceptable on a case-by-case basis. The balance of the quoted fee can be accepted prior to or on the day of surgery. The price listed on our website does not include travel fees or the cost of meals and lodging, if necessary. In some cases, the patient may encounter a pathology fee or, costs secondary to surgical implants. The price displayed for the procedure is valid for 60 days. For more information, visit our Payment Methods and Transparent Pricing pages. How do I arrange a surgery? It’s easy! If you or a loved one find out you need surgery, give us a call. We will refer you for a consultation with one of our affiliated surgeons in Charlottesville. In some instances, depending on the procedure needed, the surgeon’s preferences and distances involved, the initial consultation can be done via videoconferencing. How will a surgeon be selected? You may request a surgeon if you have a preference, or one will be selected for you by our office staff. What if the surgeon determines I don’t need surgery? Our package price typically includes a $250 surgical consultation fee. If you are not a candidate for surgery, you are only responsible for the consultation fee. It depends on your planned procedure, health status, and personal desires. We offer everything from local to regional to general anesthesia, so your anesthesiologist will discuss options with you prior to your surgery. Regional anesthesia refers to numbing the part of the body where surgery is taking place. (General anesthesia refers to instructing the brain not to feel pain across the whole body.) It is very similar to local anesthesia and uses the same principles. Your center emphasizes regional anesthesia. Why? Where possible, our anesthesiologists favor regional anesthesia with sedation because it provides a quicker wake-up, better pain control and considerably less nausea and grogginess. Rest assured that even if you elect regional anesthesia with sedation, you will be completely asleep, comfortable and unaware of your procedure. What if I get anxious about anesthesia? If you have questions or concerns about anesthesia prior to your surgery, please give the center a call and ask to speak to a member of our anesthesia team. We’d love to discuss your options and answer concerns. Together, we’ll formulate a plan to suit your specific needs (which may include medications to reduce anxiety) before you arrive for your procedure. Visit our Resources for Existing Clients page to learn more about what to expect the day on the day of your surgery. 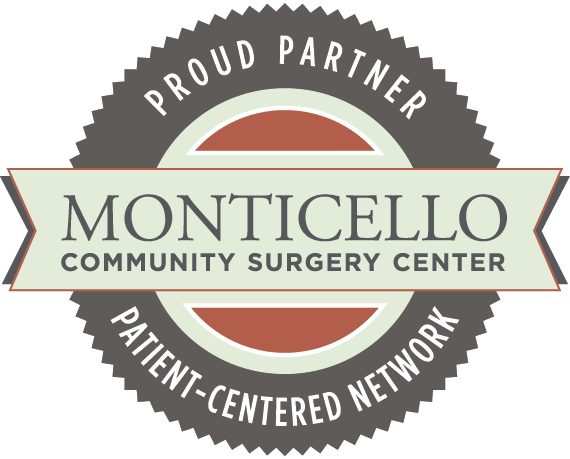 Where is Monticello Community Surgery Center located? For Charlottesville residents, MCSC is right around the corner! Our intimate, state-of-the-art space is located at 2331 Seminole Lane, Suite 201, just 3.5 miles north of 250. What do I need to know about parking? Is there a lot fee? Because Monticello Community Surgery Center was designed as an accessible community space, we offer plenty of parking right outside our front door. No more navigating confusing hospital parking lots when you’ve got surgery on your mind. Just drive up and park free of charge. I’m traveling from outside the area. Can you help me make travel arrangements? Our patients live everywhere from downtown Charlottesville to California to the Caribbean. If you’re traveling from outside the area, we’d be happy to help you arrange your accommodations, a shuttle to and from the center, and even offer some dining suggestions! Email our travel division at travel@monticellosurgery.com and we’ll get started. Have additional questions you don’t see here? Contact us directly here.